This was a beautiful evening at the beach after I had taken a long list of names written in the sand, then took a moment decided to stay a bit longer! I am so happy I did because the sky was painted perfectly that evening! 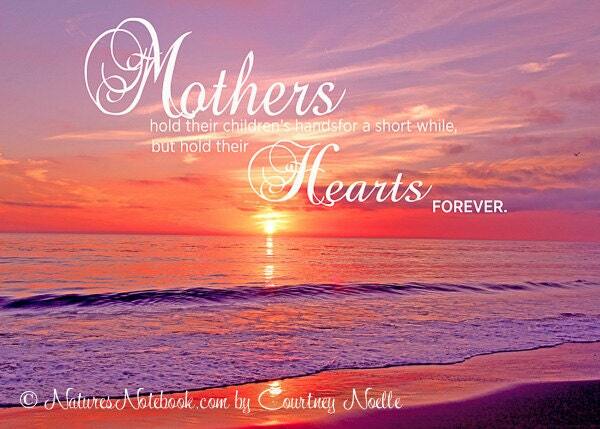 Mothers hold their children's hands for a short while, but their hearts forever. This will make a great fit for any mom. -The Watermark will be removed before it is sent to you for printing. 1.) PRINT IT YOURSELF in the comforts of your home, or 1 hour photo printers ( like Walgreens, CVS, Shutterfly, Costco If there is a special size you do need, please let me know and we can work on it for you. 2.) If you want me to print it for you send me a convo for a quote.